Homework is set after each session, and Candidates are required to complete and return the homework at the beginning of each session. Homework can be seen below. Each Session will take place at Our Lady of Lourdes Presbytery at 6PM (sharp) and will last for an hour. However to prepare for the session we start with a quite period of reflection, so if candidates are unsettled the session may extend slightly over the allotted time. 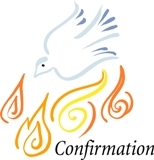 If you have missed a session, contact the Confirmation Catechist with the session date, and the necessary confirmation sheets will be sent to you.